Before my first trip to Africa I was trying to find information what is most dangerous animal in Africa. Lions? Crocodiles? Elephants? Rhinos? No. For my big surprise it was hippopotamus. It is one of largest animal in the world (only whales, elephants and rhinos are bigger), but still I didn’t think it could cause much danger. 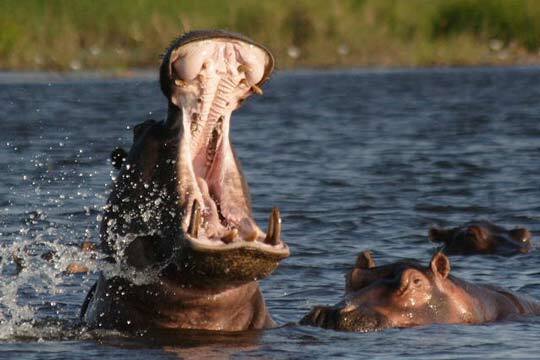 Unfortunately hippos are very aggressive animals and can attack humans without any provocation. It can happen on land if it happens somebody stands on their path back to water. It can happen in water if hippo resurfaces to breathe in and boat was going right to that place. The good thing is – hippopotamus are territorial animals and locals usually know where animals resides and goes by boat in shallow water to make sure nobody is under the boat. So thought it is dangerous animal it would be very rarely you would fall in situation where hippo would treat danger for your life. Just take good binoculars to your safari and enjoy these animals from distance. Above picture was taken in the Okavango Delta, Bostwana. This is one of the world’s largest inland water systems. Yup, use common sense, and you should be OK. Don’t provoke them; don’t get in their way. It’s simple really. But, you get gung-ho people who try to get as close to these things as possible, so it’s no wonder some get hurt. Some do it by accident too, I suppose. Yes. Wow, I didn’t know that the hippo was so dangerous. This seems pretty amazing, but I don’t think I ever want to get close to them to find out how dangerous they may be. Never think that hippo is the dangerous animals in Africa. But I heard some news before that hippo attacked some men during their trip in one of the jungle in Africa. My bet for dangerous animals was either snake or crocs but never imagined hippo to be dangerous.